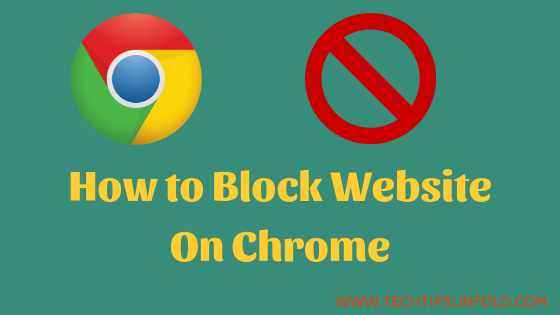 How to Block Websites on Chrome – If you are looking for a precise and easy to follow guide on How to Block a website on chrome browser, then you are in the right place. In this article, we will let you know How to Block websites on Google chrome browser in both Android smartphone and PC. Google Chrome is an excellent browser and it is built by search engine giant Google. Google chrome currently has 62.0% of total browser market share. Google chrome provides you an extensive tool set to customise all the settings. You can control everything with the advanced settings it gives you. But unfortunately, there is no official feature available in Google chrome to block a particular website. But don’t worry. Using few tricks we can still achieve that and block a few websites on your chrome browser. Why to block a website? Blocking a particular website is a very useful feature especially for parental control. Parents can use this feature to block or restrict few websites from accessing for their children. Or if you are a social media addict, you can block all the social media websites on your browser so that you may use it less often. Block all these websites according to your requirements. We will provide you an extensive guide on How to Block Websites on Chrome in Android and PC. 0.1 Why to block a website? There are quite a few methods available to Block websites on Google chrome browser. If you are using internet on the home network(router), then you can even block website access to the entire router network as well. We will list down all the methods with Pros & Cons and in an easy to follow step by step guide. Every router provides you an extensive set of features to Block any website. One of the best advantage you will get by blocking a website at router level is you can restrict the access to that particular website across all the devices using that home network. Follow this step by step guide on How to Block Website on Chrome using router configurations. Step 2: Type the following IP address in URL bar and hit enter. Above mentioned are the default router IP addresses for any type of router. If one doesn’t work, try out another ones. Or you can search on Google for your router’s default IP address and password. Step 5: Next configure ‘Deny Access to only these website‘ option by entering the URLs which you want to block and save that. Further if you try to open that particular website on any browser on that network, it will throw an error saying that particular website is blocked. Few of the routers comes up with advanced features like parental control and lets you control what you browse throughout the network. So you can use this method to block any particular websites for both Android smartphones and PC Laptop as well. Google Chrome browser provides an extensive toolkit of extensions that can do any job for you. Similarly there are few extensions available in the chrome store to block sites. You can install this extension on your laptop’s Google chrome browser and block a particular website that you want to restrict from using. Let’s start step by step guide on How to Block Websites on Chrome PC using Blocksite extension. Step 3: Once you are in that extension page, click on ADD TO CHROME button as shown in the image below. Step 4: Now pop up window will open asking to allow required permissions access to function properly. Allow all of them by clicking on Add Extension button. Step 5: It takes few minutes to download and install the extension depending upon your internet speed. Step 6: Upon successful installation, It will again ask you to agree for automatic blocking few sites. Click on the ALLOW button as shown. Step 7: Now you should be able to see ‘Block Site‘ Extension – Red colour shield icon beside the URL bar as shown in the image below. Step 8: Next click on that Block Site Icon and then Settings (Gear icon). It will prompt you to enter any websites that you want to block. Or you can block a particular website using another method as well. Just open the website that you want to block on that laptop/chrome browser -> Right click anywhere on that web page -> You will find Block Site extension button with red shield icon. Just click on that. That particular website will be added to that blocked websites list. Now every time you visit that blocked website, you will get error message stating that website is blocked by Block site. This way you can restrict children from visiting any harmful websites on their laptop. Only disadvantage of using this method is – If anyone get to know how to remove a websites from the blocked list, then they can bypass this restriction. As mentioned above – Blocksite is available for Android platform as well. You can simply install the application from Google Playstore and block websites on android chrome. Here is the how you can Block websites on Chrome android smartphone. Step 4: Once installation is done, you can find the Blocksite icon on your home screen. Just open that app. Step 5: Now click on the + symbol in green colour at the end of the screen as shown in the image below. Step 7: That particular URL is block listed now. You can check whether it is working properly or not by entering the URL on chrome browser. You can even block using particular Apps as well with this method. Similar to the process where you will block list the website, you can find ‘Apps‘ option as well. Just select that and choose whichever the app that you want to restrict people from using it. There are even more apps available on How to Block websites on Chrome. If you are using any other web browser, then they provides you an inbuilt option to block websites. Firefox, Internet Explorer etc are having this feature but not yet implemented in chrome browser. If you want to block a particular website across your home network, better do it at router level. It is easy method and you no need block in each and every device. Otherwise Blocksite is an excellent alternative. One of the best advantage of using Blocksite is you can block apps as well with it. I’m concluding this article on How to Block websites on Chrome. You can even block Android apps with one of the method mentioned. So this is the precise guide on How to block a website on Chrome with step by step method. If you are still having any issues using these methods, do let us know through your comments. We will be glad to help you. Cheers!